In 1940, Brother Henry Ayrout, an Egyptian Jesuit, was sure that development was a matter of education. He created AUEED, so that disadvantaged children of Upper Egypt could have access to education. Along with his team, he started to build schools! Some 75 years later, AUEED has been managing, among other things, 35 primary and secondary schools, workshops to help women develop their skills in sewing and literacy. Each year, more than 11,000 children receive partial scholarships and quality education. It is located in many cities and villages of Upper Egypt. The head office is located in Cairo. Les enfants d’une école primaire de l’AUEED! 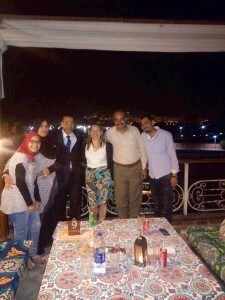 Rushdy & Sam, AUEED Luxor with a student and her parents. I went and met children and teachers. It’s really exciting to see how well structured schools are and how children are happy. Parents and children receive hygiene and health classes as well. AUEED also organizes cultural activities in schools: sports, choir, drawing, etc. It must be said that in Egypt, the education system is weak. If the government takes care of education at every level, it faces a galloping demographic (more than 92 million people) and does not fund enough the education system. This is worrisome for the next generations. Middle-class parents send children to private school and sacrifice themselves so that their children can have the chance of success in life through education. It was an honor and a pleasure to meet Dina, Samia, Hanee, Bassam, Rushdy, Sam, Yvonne, Michael, Ms Vermet and all their teams. Thank you for your welcome and for letting me know the great work you are doing. http://www.upperegypt.org/How%20Can%20You%20Help/Sponsor%20Child.htm and that of the association that supports them in Quebec: http://www.pache.ca . Next and last post of this series : Welcome to the temple of one of the few female pharaohs : Hatshepsut.